TruckNet - Complete control over your Virtual Trucking Company. We have a large amount of VTCs using TruckNet! VTCs with TruckNet have a huge amount of drivers! TruckNet companies have driven around the world! If you have any questions regarding TruckNet or have any requests for features, feel free to email me below! Introducing TruckNet, a Virtual Trucking Management tool built to support your company in it's growth. Simplifying the setup, management and hiring process to allow you to focus on what matters, driving. TruckNet is an advanced platform used by some of the largest Virtual Trucking Companies in the community, it combines multiple technologies to provide a simple approach for your drivers to keep track of all their deliveries. With the dynamics of the virtual world expanding, TruckNet gets frequent updates to bring new features that cover all bases. As a tool built for the community, we are constantly looking and adding feature suggestions we love, so it's not just a tool for one but a tool for all. 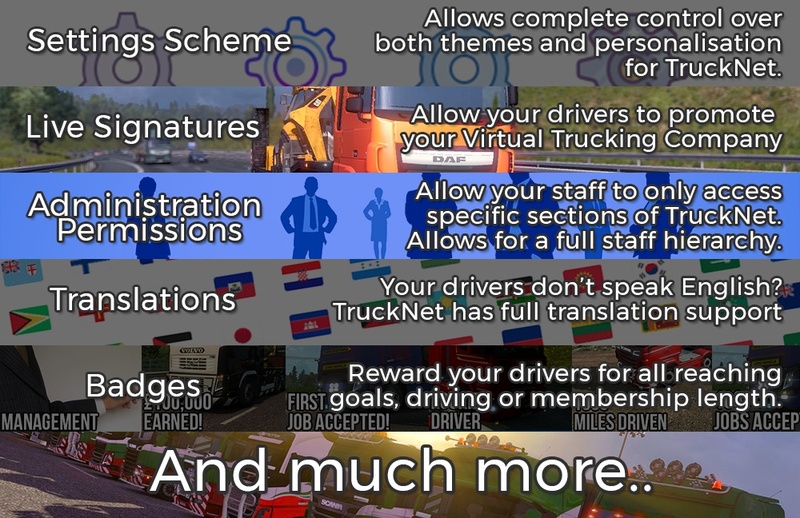 TruckNet is one of the many projects created by StuartD.